I know that we should not generalize about nationalities. But a little naughtiness is good for us now and then. So let me share with you The Royce Test. 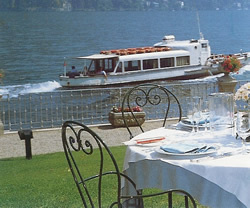 This sensitive and highly accurate method of judging the character of a nation came to me as I was dining by Lake Como. It is stated simply thus: national characteristics are revealed by people’s reactions to my motor car. As I trundle around Europe in my 1963 Rolls-Royce Silver Cloud III, I have observed that the French are politely interested, the Germans are coolly indifferent and the Italians… Well, the Italians – by the flashing of lights, the sounding of horns and the emission of cries of delight and whistles of admiration – exhibit a degree of operatic enthusiasm which is utterly captivating. They easily score top in The Royce Test – a fact upon which I continued to muse throughout my dinner at the Ristorante Imperialino. You will, I think, like this restaurant. 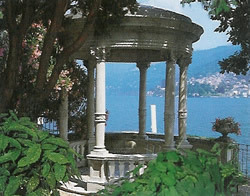 It is part of the Grand Hotel Imperiale, six miles from the city of Como. 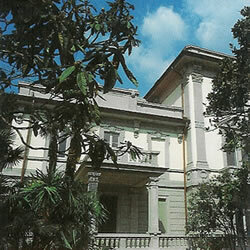 It occupies a separate building – a handsome Liberty style villa – right on the edge of the lake. The evening being warm, I sat in a wrought iron armchair at a round table on the terrace. I noticed the circular stone temple in the garden and then looked down the sloping green lawn, over the balustrade and across the waters to the twinkling lights opposite. This was, indeed, a beautiful spot for dinner. I was looked after in a friendly and efficient manner by the excellent assistant maitre d’ Roberto Galli. He and his waiters, in their grey waistcoats, seemed keen to ensure that everyone was having a good time. And, as far as I could judge, everyone was. People come here for good, traditional food at reasonable prices. And that is exactly what Chef Christian Bertogna delivers. He takes fine ingredients and he treats them in a straightforward way. 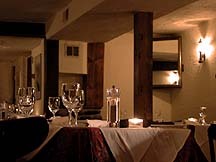 A set meal is available for 36 euros. My four courses from the carte were 47 euros. Beef carpaccio with truffle yielded a lovely smell of the divine fungus. Gnocchi, with parsley and butter, were decently done. Then sirloin steak, cooked rare, was sliced by the table and laid onto a bed of rocket and tomatoes, scented with basil – over which I squeezed a fresh lemon. This wonderfully old-fashioned dish was full of robust flavours. It was entirely appropriate to finish with a jolly good tarte tatin with vanilla ice cream. The wine list is very short and very much to the point. 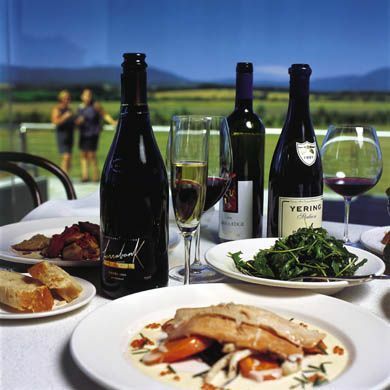 A bottle of white can be had for 15 euros and Mr Gaja’s 1998 Barbaresco for 260 euros. In between, I spotted some super Tuscans at very friendly prices indeed: 2000 Tignanello at 90 euros, 2000 Solaia at 140 euros and 2001 Sassicaia at 105 euros. I asked Mr Galli to recommend a big, bold white with lots of toast and butter, and that is exactly what he brought – an excellent chardonnay from Sicily (Tasca d’Almerita, 2002 – 46 euros). And my red from Lombardy proved the ideal partner for the beef – tannic, of considerable weight and with lots of ripe fruit (Rosso del Sebino, Maurizio Zanella, 2000 – 70 euros). I enjoyed my visit to the Ristorante Imperialino, not only because of its pretty location and its welcoming hospitality, but also because of its niche in history – as the place where The Royce Test was born. 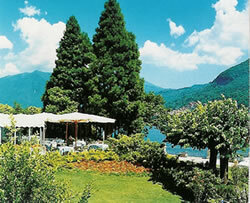 (Grand Hotel Imperiale) Via Antica Regina 26, 22010 Moltrasio, Lake Como, Italy.